Preheat the oven to 200ºC, gas mark 6. Thoroughly drain a 430g pack Cooks’ Ingredients Chargrilled Aubergines, reserving 1 tbsp of the oil. Cut any large slices into 2 or 3 pieces. Heat the oil in a frying pan, add a 250g pack Waitrose Organic Portabellini Mushrooms, sliced, and fry until just soft. Drain well and mix with the aubergine, along with a 395g can Waitrose Cherry Tomatoes. 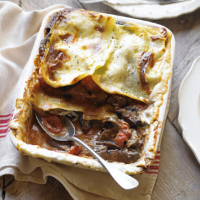 Cover the base of a lasagne dish with 2 sheets from a 300g pack fresh Waitrose Lasagne, and top with 2–3 tbsp from a 350g tub Waitrose Half Fat Cheese Sauce. Layer with half the aubergine mixture, top with 2 sheets of lasagne and repeat the process, finishing with a layer of lasagne. Top with the remaining cheese sauce, then bake for 30 minutes, or until brown and bubbling.